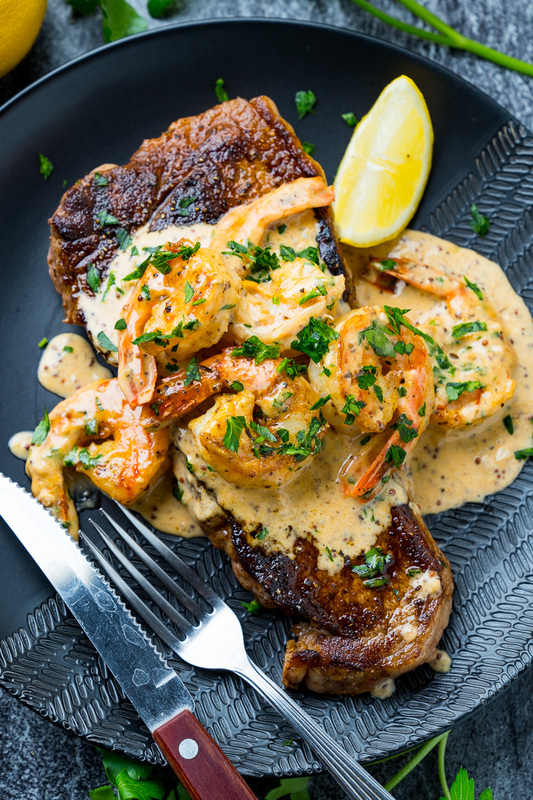 Pan seared steak in a creamy cajun shrimp sauce! Surf n turf at it’s best! 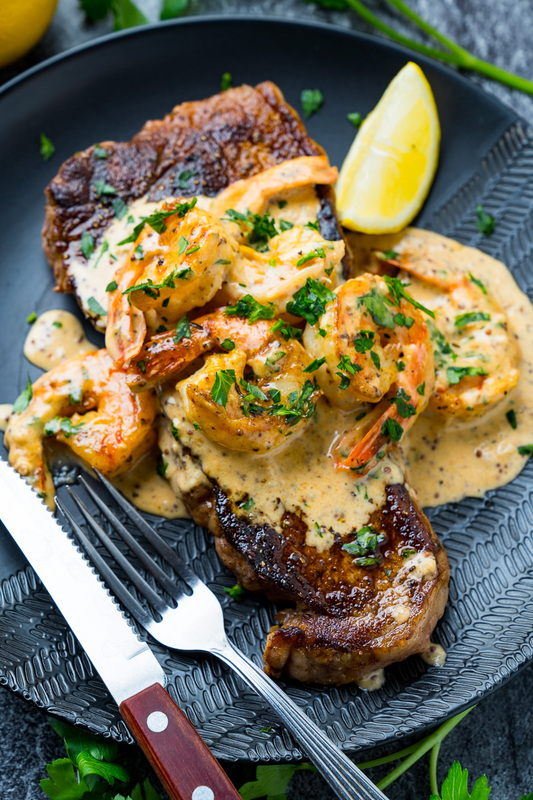 I always enjoy steak for Valentine’s Day and things only get better when you add some seafood (surf and turf) like in this steak in creamy cajun shrimp sauce. This recipe is so easy to make! You pretty much just season the steaks in cajun seasoning (I like to make my own to control the amount of salt in it), sear them and set them aside before starting on the shrimp sauce in the same pan. 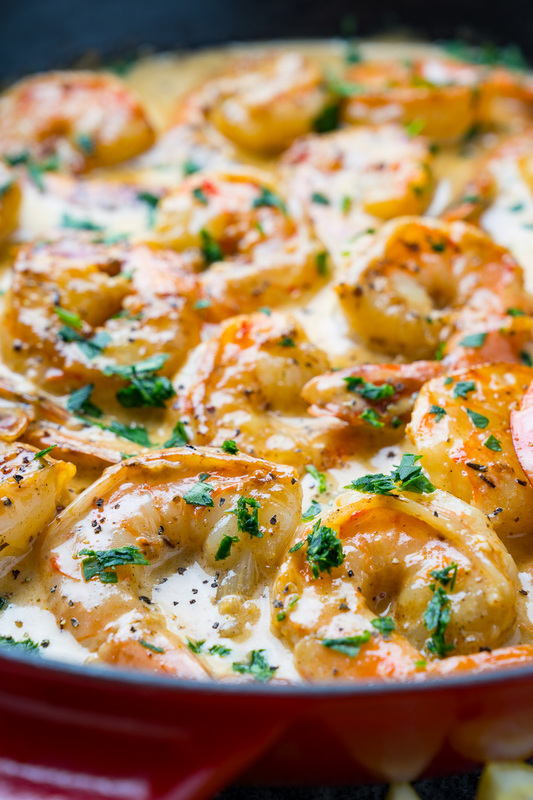 The shrimp sauce is a simple butter, garlic and cream based sauce along with the shrimp and more cajun seasoning that is finished off with parmesan cheese; basically a cajun take on an alfredo sauce! 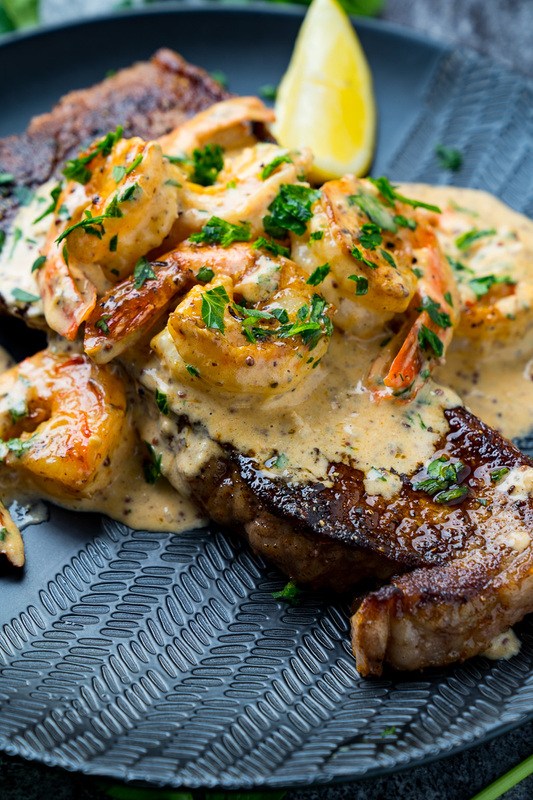 Once everything is done you serve the steaks smothered in the creamy cajun shrimp sauce and enjoy! 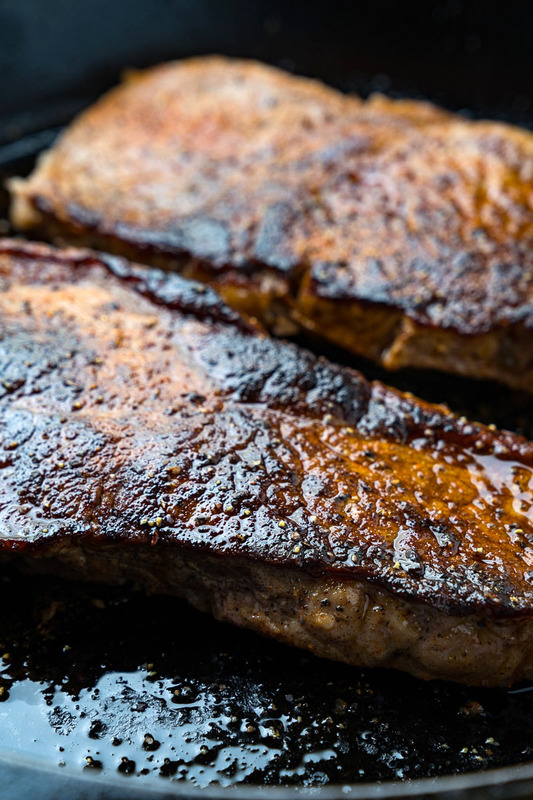 Heat the oil in a large skillet over medium-high heat, add the steaks and sear until lightly browned on both sides and cooked to the desired level of doneness, before setting aside. 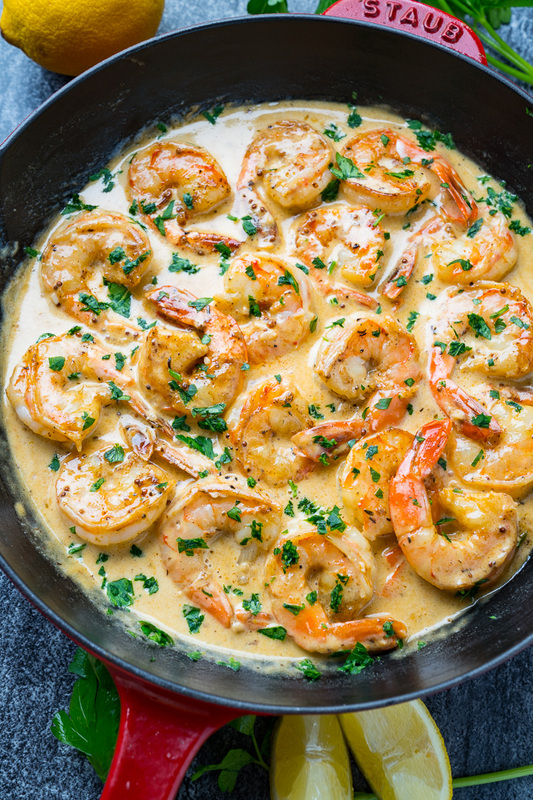 Reduce the heat to medium, add the butter and let it melt before adding the shrimp and cooking until just pink on both sides, about 1-2 minutes per side, and set aside. Add the broth and deglaze the pan by scraping up any brown bits from the bottom with a wooden spoon as the broth sizzles. Add the cream, mix in the dijon mustard and cajun seasoning, bring to a boil and let simmer for a minute. Mix in the cheese and let it melt into the sauce. Mix in the lemon juice, parsley and shrimp and serve over the steaks! Why leave tails on the shrimp? Do you eat with your hands to pull the tail off? Or are you supposed to eat the tails? I’ll never understand that. Might as well leave shells on eggs and let people pick it out. Most restaurants leave the tail on for presentation, and in a picture, it really does look better. The same way a lobster tail is served with the meat still in the shell I suppose, usually just sliced in half to reveal the meat. No, you do not eat the tails and yes, you have to pick it up with your fingers, or pick it up with the fork to put it in your fingers so you can pull the meat out of the tail. Unlike eggshells, the tail stays intact on the shrimp so you shouldn’t have to pick it out of the dish. I also prefer not to use my fingers when i cook shrimp in a sauce so I take them off but I will always keep them on if I skewer them on the BBQ. It’s a preference, not a rule. Really good Kevin! But I’m not surprised, your recipes are rarely a miss, and I’ve tried ALOT, I didn’t put it on top of steak though, my husband likes his steak quite simple to get the full beef effect, lol! but I used the sauce on pasta so I just had to thin it out a bit but it’s a winner! Thanks for sharing!